This plaque can be found inside the Western Isles Museum, located on Francis Street in Stornoway. It hangs above the stairway and commemorates Old Boys from the Nicolson Institute, the island's secondary school. The Museum used to be the main building for the Nic, which is now located about a hundred yards away, on the other side of Matheson Road. Will include a picture at next opportunity. Moving this post to the "Schools Memorials" section. 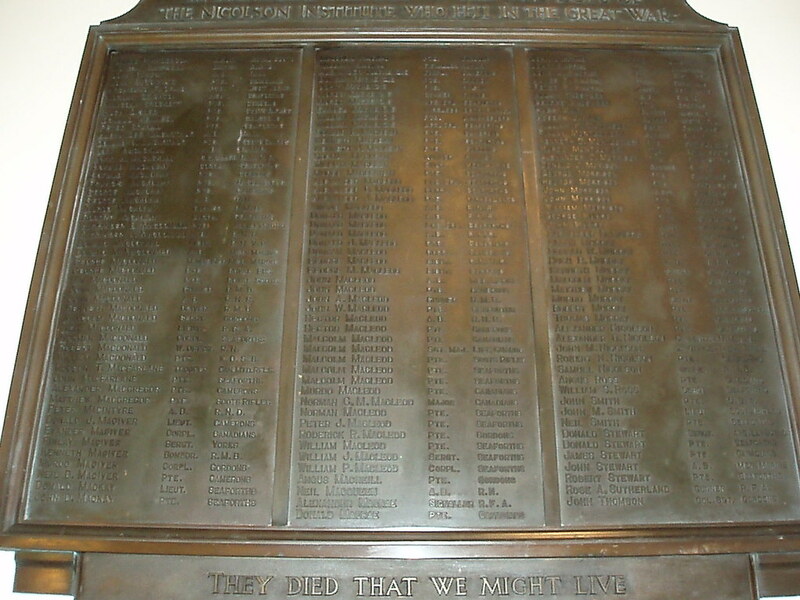 This is the Nicolson Institute First World War Memorial plaque. The Second World War Memorial plaque is inside the entrance to the Nicolson Institute on Springfield Road (main office). Have posted an image of the Second World War Memorial at the Nicolson in a separate thread. Archibald F. Craig Pte. West Yorks. John A. Macaskill Signaller R.N.V.R. Francis Macaulay Pte. Royal Scots Fus. Alexander D. Macdonald Pte. Argyll & Suthd. Alexander J. Macdonald A.B. R.N.R. George Macdonald Pte. Royal Fus. Robert Macdonald W. Offcr. R.N. Hudson T. Macfarlane Trooper Can. Mtd. Rfls. Samuel Mackenzie Wireless Optr. R.N.R. Alexander J. Macleod Pte. Yorks. & Lancs. John A. Macleod Gunner R.M.B. Hugh Mair Gunner Austr. F. A.
Joseph J. Mair Gunner Austr. F. A.
Alexander D. Morrison Pte. R. Welsh Fus. Donald J. Morison Gunner R.F.A. Hugh B. Murray A.B. R.N.R. Matthew Murray Pte. Argyll & Suthd. Robert Murray Pte. Argyll & Suthd. Alexander D. Nicolson Carpenter H.M.A.N. Donald Stewart Sergt Argyll & Suthd. Rose A. Sutherland Gunner R.F.A. James Parker Anderson – age 34 – Second Lieutenant, Seaforth Highlanders. James was educated in Langholm, Dumfriesshire before he studied at Edinburgh University where he graduated M.A. in 1908. After attending the Edinburgh Provincial Teacher Training Centre at Moray House he became an assistant teacher at Moffat, Dumfriesshire but by July 1913 he was a teacher at the Nicolson Institution in Stornoway, Lewis in the Western Isles and he and his wife Mary and family were living in Glen House in Stornoway when he was commissioned as a 2nd Lieutenant in the Seaforth Highlanders from an Officer Cadet Unit on 18 December 1917. James was serving with the 4th (Reserve) Battalion at Glencorse Barracks in Edinburgh when he became ill in the late summer of 1918 and he died of lymphadenoma and heart failure in the Military Hospital in Edinburgh Castle. Born 1884 in Jedburgh, Roxburghshire. Son of the late Mary (Parker) Anderson and of William Anderson, and step-son of Margaret (Silver) Anderson of Newcastleton, Roxburghshire. In 1901 James was at school in Langholm and was living with his grandparents, James and Agnes Anderson at 39 Eskdaill Street, Langholm. Husband of Mary Glen (Alexander) Anderson of Perth, of the Schoolhouse, Balquhidder, and of Queen Street, Perth who he married in 1913 in Perth. Also named on the Edinburgh University Roll of Service, the Edinburgh Provincial Training Centre memorial, on the Moffat Academy memorial and on the Langholm War Memorial.